Sometimes when you get a good routine going, it's hard to change or try new things. If it ain't broke don't fix it right?! That's how I used to feel about skin care. Many moons ago, I'd have my few products that I would use and I mean ONLY use. These products were harsh and did nothing to help what I really needed with my skin, but I'm happy to finally learn more about what is better for my skin AND our planet. It's no surprise if you've been following my skin care and makeup journey that I've become a bit of a fiend when it comes to trying new products. I love finding new things that work which is why I'm thrilled to share my newest love with you. I got to try the OZ Naturals Vitamin C cleanser from the lovely OZ Naturals team (thanks so so much!) and I must say, I was very surprised with how quickly I saw results with this cleanser. I love! I'm always on the hunt for products that brighten and hydrate so anything with vitamin C gets a nod from me. This cleanser promises to deliver a brighter, smoother complexion while leaving the skin deeply clean, radiant and smooth. I used this cleanser for 1 week and every morning for the past week I noticed my skin was visibly smoother and brighter. The gentle formula would be perfect for all skin types and as a potent vitamin C cleanser I was pleased to feel that my face didn't feel stripped or dry after cleansing. and of course Vitamin C- provides protection from free radicals and supports collagen production. I was surprised to find that there are many other familiar ingredients like kaolin, glycerin, and aloe leaf extract, as well as some unfamiliar ingredients like montmorillite and illite (non expanding clays), xanthan gum (thickening agent), and P-Anisic acid (natural preservative and antiseptic). I especially love that this product is formulated without parabens, GMO ingredients, sulfates, synthetic fragrance, or phthalates. Since this product is gentle enough to be used daily, but potent enough to deliver exactly what's promised, I've added this face wash to my daily routine. Not only does this cleanser do an excellent job of giving my face a much needed deep clean, it's also fantastic at removing all traces of makeup. 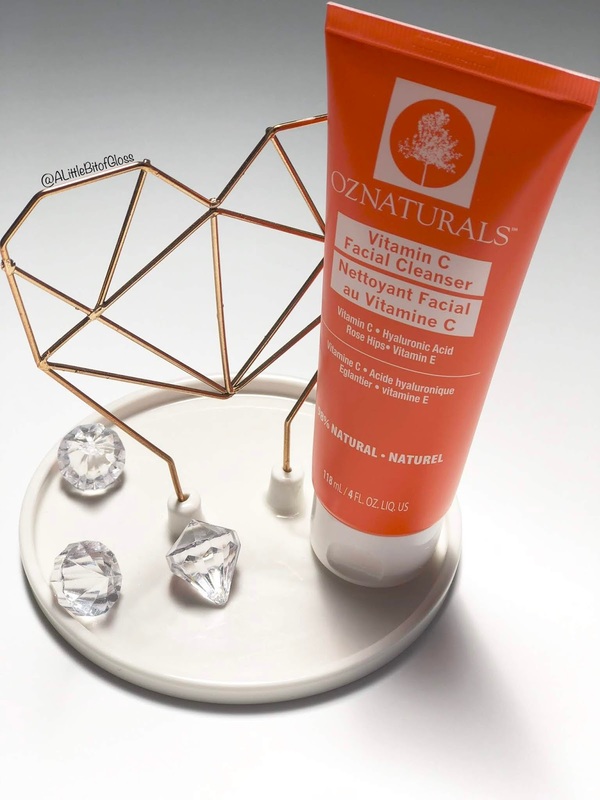 There are so many Vitamin C products in the OZ Naturals line and if you're looking for an effective face wash then this would be right up your alley! The OZ Natural's website at https://www.oznaturals.com/ has something for everyone and you can even take the skin type test to find your perfect match! I love the Vitamin C cleanser and I'm happy to have added some much needed brightening ingredients to my skin care routine. So tell me, what are your fave Vitamin C products? Let me know in the comments. I'd love to hear from you! Thanks for the review. I am looking for some cleanser lately and wanted something that can help to deliver a brighter and healthier skin. Hope it will tighten my big pores. This is a great recommendation! I love the naural ingredients. Simple and effective products are the way to go. I would love to check this one out. This stuff sounds so refreshing!! I love products that use vitamin C! They just wake up your skin! I don't actually have a favorite vitamin c product, but after reading you post I'm thinking that I should. Thanks for the honest review of this cleanser, I'll have to check it out. I didn't hear about this product before, but it does sound like it has a lot of benefits for your skin. I use a natural cucumber cleanser at the moment, when it finishes I might give this one a go. I have really got to start a proper skincare routine - sometimes I use cleansing wipes but I need a good moisturiser. I'm always on the lookout for good facial cleansers. I'll have to see if this is available in Canada. When it comes to Vitamin C, i always prefer a serum, this cleanser looks promising and its parabens, sulfate and fragrance free, will surely give a try, thanks for the review. thank you for introducing me to this product, i am always looking for new and ideal facial cleansers. Vitamin C is so good for your skin. I'll have to try this product because I'm at the age that I'm getting super concerned about my skin. I love vitamin C serums, I find that they make such a difference in my skin! This cleanser sounds great! I once got a sample of a vitamin C serum that I just loved. But I threw the bottle away and can't remember the name. I'll have to look into this one! I LOVE, love, love OZ Naturals products. I use their vitamin C toner religiously. It is a great way to really wake my face up in the morning. I have heard about OZ before but never had a review so first of all thank you for this awesome review. I have an extra sensitive skin I hope this cleanser works for me. This looks lovely. I love trying new beauty products. Sounds like it has alot of benefits. I literally had no idea that you could get vitamin C in a cleanser too! That's amazing and I can see how it would be brightening for the skin. I already use a vitamin C serum so I'd love to incorporate a vitamin C cleanser into my routine too. I have never heard about this product but it looks like a good one to try. I would definitely check this out! Great recommendation. Love Vitamin C products as they keep the skin light and healthy. This sounds like a really awesome product. I do like a natural product when it comes to cleansers! Well, this looks like it's going to be my favorite. Easy, safe to use, and simply carries everything I need for a healthy lifestyle. Awesome! I've been using the same cleanser since I was 15 yrs old (wow, that's a long time!). Been looking for something new. This looks interesting! I didn't try this vitamin C serum, but I love using Mad Hippie! It makes my skin so bright and even. You should give it a go and it's not expensive at all! I have never heard of this brand. I use Obagi vitamin C serum and I totally love it. I will explore the vitamin c cleanser you have recommended. What a nice product! I am looking for organic and healthy supplement. Should try this. I am horrible at getting into a proper morning routine. This cleanser sounds great and vitmain c is so good for you. Do you think that this cleanser would be good/strong enough for the winter?